Which 360-degree camera is right for you? Please note that this is a general overview of the cameras available on the market early 2016. While all of the mentioned cameras are compatible with HoloBuilder, NOT all of them are compatible with our JobWalk app. To have the best possible experience with our JobWalk app, please use, e.g., a Ricoh Theta or another camera listed here. An example for a spherical raw photo in 360 degrees: “From the Kitchen Countertop. Hilltop Castle Near Willits”, image courtesy Bob Dass (https://flic.kr/p/pY71s9), CC BY 2.0 licensed, no changes were made. Why a 360° photo? 360° pictures, also called “photo spheres”, capture 360-degree panorama scenes. Do you know this feeling when you are in the middle of a great landscape but a simple photo is just not able to capture the entire scene? Or, you are a real estate agent and want to show your properties from their best side online in advance to a personal tour to attract the most suitable customers. Furthermore, you can use the 360° pictures to save time and money with the documentation of construction sites. What do you need? When a 360° picture is taken, you first get an equirectangular image that looks like the one at the top. An easy-to-use free application like HoloBuilder allows you to create and share interactive 3D and 360° experiences like this one. What else do you need to get started with your first own 360° image? Of course, you’ll need some kind of camera which is able to capture 360° photos. The best option to easily get your first 360° approach for free is to simply use one of the convenient smartphone apps. If you prefer to use a dedicated hardware, like for any other technical equipment, there are several camera products targeting people with different aims, ambitions, and budgets. We’ll provide a general overview of the existing hardware which should help you decide which equipment fits your needs best. In the following, we present hardware for casual, intermediate and expert users. Several Apps for capturing 360-degree images are available in Google’s PlayStore respectively Apple’s AppStore. Many produce good results in terms of stitching the images together, but the downside is that they do not give you access to the images source file. This means you can only view and use the shot 360° images within the App or on the developer’s platform. Thus, you would not be able to make use of any HoloBuilder’s enriching features (like 3D models, text, sound, hotspots, and many more) to enhance your creations and produce awesome virtual tours. A great option is Google Street View which is available for Android as well as iOS. Please do not get confused, Google re-branded almost anything related to 360-degree images with “Street View”. It does not imply that you’ll have to use this platform for publishing the images you shoot. We have made the best experiences with this App because it produces good results and allows you to save the original image. But, as with any App, it is much more complex and time-consuming to create a photosphere compared to a one-click-solution with a dedicated camera. So, if you decide to get serious with 360-degree content, we’d recommend you to consider investing in one of the following cameras. 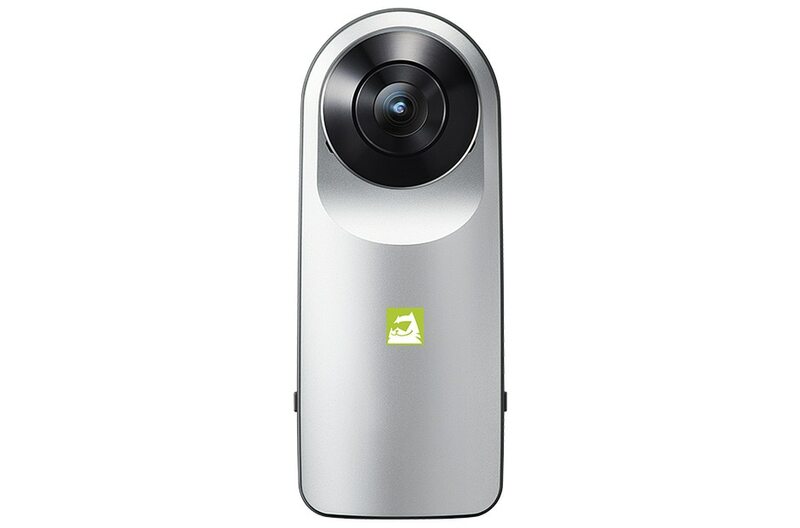 The LG 360 CAM is the cheapest 360° camera among the models for casual users. Nonetheless, according to a review by chip.de, its quality is quite satisfying. It fits nicely into its user’s hands and with a weight of only 97g, it is the lightest model of the three cameras. The design is compact and easy to use due to only a few necessary buttons but the body looks a bit less high quality than the elegant Theta S. With two lenses on each side, its image and video resolution is comparable to the Theta S and even slightly outperforms it. However, when in the field, the resulting images show slight overexposure and blurredness, especially when the lighting conditions are difficult. Chip.de also reports fuzziness in the video mode, especially on the borders. The battery suffices for approximately 70 minutes so be sure to bring a charger on a trip. Its internal storage only has a capacity of 4GB but can be upgraded with an external microSD card. Don’t forget to have a microSD card available or order one with your LG 360 CAM because according to amazon.com it cannot be activated without external storage. In contrast to first reports stating that the cam is only compatible with the LG G5 smartphone, suitable applications are provided for all common smartphones and operating systems. The LG 360 CAM is available at Amazon or your local electrical retailer chain. The Ricoh Theta S offers a very good cost-benefit-ratio. For less than 400€/ US$350, you get an easy-to-use camera which allows both impressive high-resolution panorama photos and satisfying HD videos. The resulting 360° images are characterized by clarity and a nice exposure with a soft and seamless stitching. Furthermore, it fits comfortably in your hand and pocket with a weight of only 125g. The Ricoh Theta S is especially suited for quickly taking pictures outdoor and thus, a very good choice for casual users indenting to capture their memories on a trip. With 8GB of internal memory (9000 medium quality pictures) and a battery lifetime of approx. 260 photos, the Theta S is a reliable companion. WiFi and USB-Connection allow you to live-stream your pictures and videos to get an immediate impression of the result without having to wait until having access to a computer. Eventually, the Theta S is a major improvement compared to its predecessor Theta m15. However, if you prefer a cheaper model, you can have a look at the comparison of both models in this tutorial. To get an impression of the results yourself, you can have a look at for example this Holo or this Holo. The Theta S is available at Amazon or directly at RICOH for €379. 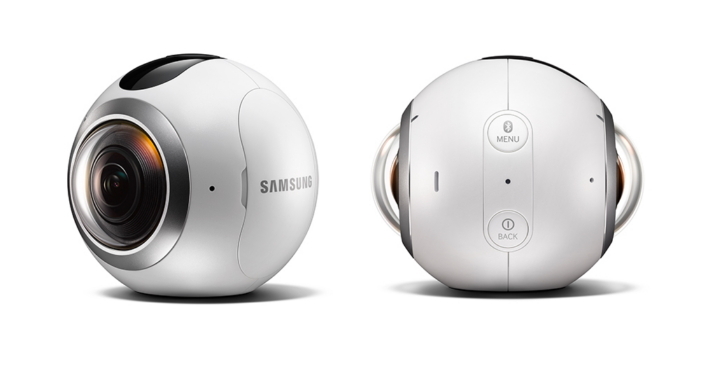 The Samsung Gear 360 is very rarely available for purchase in the United States, but the situation is expected to change quite soon. First shops list it at a price of $499 in the US and selling it for 350€ in Europe, making it affordable for casual users while providing a significantly better image and video resolution than many competitors. However, as the Samsung Gear 360 camera is very rare at the moment, reliable information is as well. According to Samsung’s official website, the Samsung Gear is pretty outdoor friendly as it is robust to dust as well as splashes and thus perfectly suited to accompany you to all the action events you want to capture. Nonetheless, it comes in a nice spherical and futuristic design. Another advantage in contrast to its competitors is its storage capacity as it supports removable microSD cards up to 128GB. Apart from WiFi, Samsung also uses Bluetooth to allow its users to shoot in live view mode and then directly stitch and edit the photo on a mobile device before sharing it online – access to a computer is unnecessary. When they were newly announced, we also did a first comparison of Ricoh’s, LG’s and Samsung’s casual 360 cameras. If you are interested, have a look at this post. The V.360° camera is the best choice for you if you value a robust and durable device over the best resolution. It especially targets sports and action enthusiasts who want to capture all 360° of their exciting adventures. Its special features include shock and dust resistance as well as waterproofness in up to 3 feet (approx. 90 cm) of water for 30 minutes. Using GPS, a barometer, and an accelerator, the V.360° can track all of your moves. To capture all of your action moments, it supports mounts for mountain bikes, surfboards, helmets and any almost any other surface. A 2610 mAh Lithium-Ion battery clearly outperforms its competitors and thus, supports also long trips being recorded. As most of the other devices, it supports WiFi, Bluetooth and USB 3.0 connections to save and share your videos and pictures. However, as mentioned earlier, with 8MP panorama resolution and HD video resolution, it cannot compete with other cameras in this price range but is yet able to provide satisfying results. You can order it for $449 at the vendor’s website (VSN mobil). The Giroptic 360cam consists of three cameras with 185° fisheye lenses that enable it to capture 360° x 300° equirectangular images and videos. It offers a 4K resolution for images and 2K resolution for videos. The cam looks like a small robot’s head with the eye-like lenses and the printed mustache. This innovative design results in maximum versatility and durability, making it a tool for everyday life according to the website. It is waterproof as well as shock-resistant and offers many useful features such as rechargeable battery, tripod mount for adaption to any camera accessory, a light bulb mount for a light socket for streaming over WiFi and much more. Another strength is the possibility to directly watch and share the results on any device. For an impression of possible results, you can have a look at the examples available on the website. The Giroptic 360cam is shipping to Kickstarter-backers at the moment and available for public pre-sale at 499€. The Bublcam is a 360° camera promising photos and videos with “absolutely no blind spots” as it is equipped with four 5 megapixels cameras, providing equirectangular images with a resolution of 5,376 x 2,688 pixels. Equirectangular videos have a resolution of 1984×992 pixels when filming with 30 frames per second. Thus, its target group consists of commercial as well as consumer users for whom resolution is a key factor. Although a bit bigger and heavier than the casual models, the ball device is still handy and offers a longer-lasting battery capacity. Apart from these characteristics, it does not provide any considerable advantages in contrast to its cheaper competitors. If you want to get an impression of the possible results you can have a look at some examples available. At the moment, the Bublcam can only be ordered on its website. 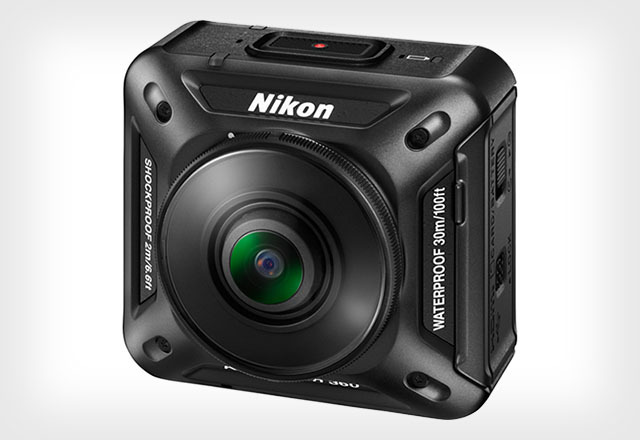 The Nikon KeyMission 360 is another sports and action talent. Although both target sports enthusiasts, the KeyMission, and the V.360° quite differ in their exterior design. The KeyMission or “the action cam” as it is named by Nikon itself looks more like a very compact version of Nikon’s other highly professional cameras. To live up to this name, it promises to be waterproof to 100 feet (30m) and to be able to handle the bounces of rugged terrain as well as dusty environment and extreme weather conditions. 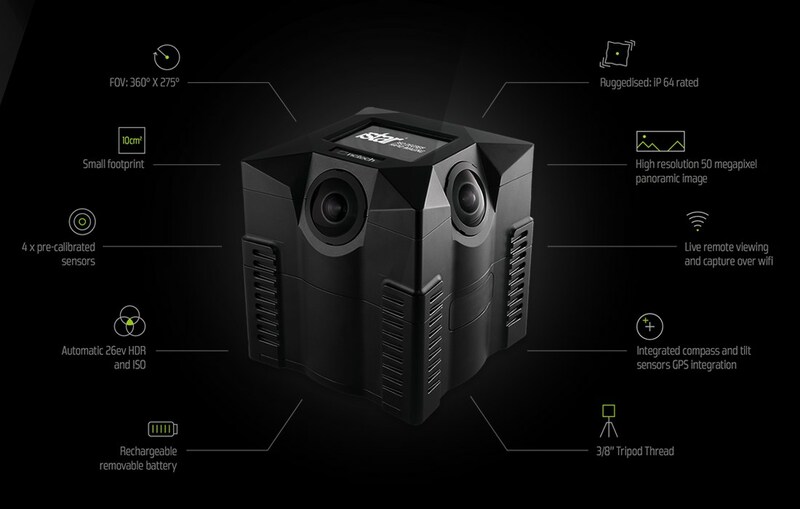 It can be mounted to almost every surface and thus, can be taken on every adventure to capture 360° images and video of the most exciting experience. However, it cannot only be used for extreme action but also capture moments of your everyday life and exceptional journeys. In contrast to the V.360°, it also comes with some typical characteristics which distinguish Nikon as a high-quality camera manufacturer. The video resolution is said to be 4K and the two NIKKOR objectives promise to create seamless 360° images and videos. Additionally, the performance is enhanced by an image stabilizer to provide great depth of field. Nonetheless, no official price has been released yet to determine if the KeyMission is affordable. The Panono is a throwable ball with WiFi, roughly 11cm in diameter, carrying 36 fixed-focus cameras with 3 megapixels each, thus, resulting in high-quality 108-megapixel images at maximum, depending on the overlapping for stitching. It offers no support for video capturing yet. 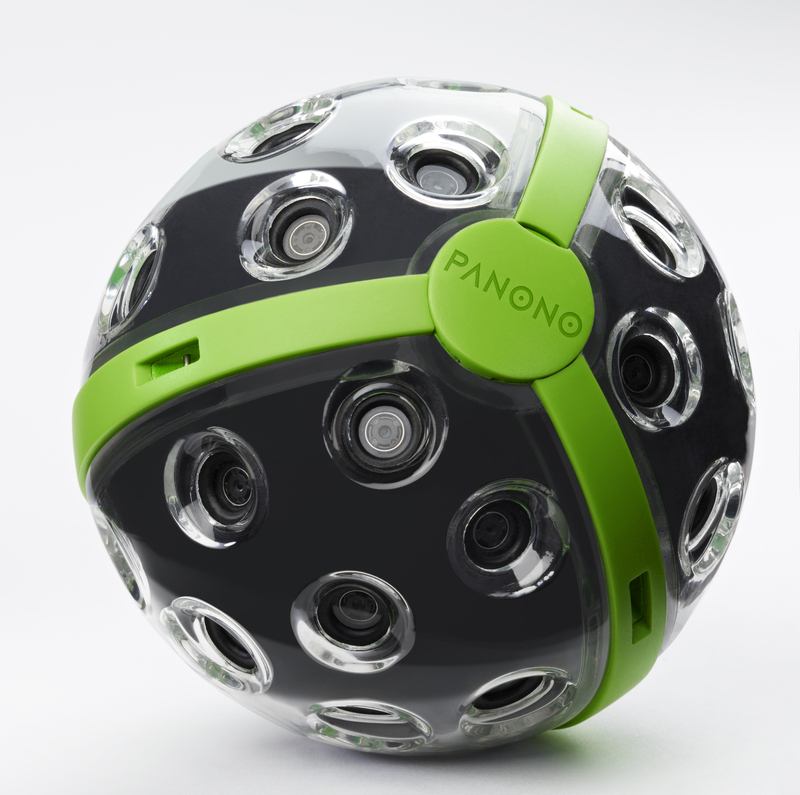 The ball-shaped camera is available for €1500 in the Panono Web Shop only. If you are interested in details you can have a look at a review of an earlier version of the product. The producers also provide a nice overview with details on the capturing process. Some interesting B2B-examples on their website provide an impression of what’s all possible with the Panono camera. With a focus on videos, the company of 360Heros Inc. provides spherical mounts for users of GoPro Hero4/Hero3+/Hero3 cameras. The mounts arrange them in a way that the images of all devices can be combined into one very high-resolution spherical image. Depending on the amount of GoPro Hero cameras you own, you can buy holders that match this number of devices, for example, six or ten. This gives you the flexibility to set an individual output resolution, so, for example, the H3Pro10HD provides 360° full spherical videos in 12,000 x 6,000 pixels. The holders are made out of one piece of high strength aircraft grade flexible nylon and are available in their store, starting at $495 for the H3PRO6, which can hold 6 GoPro Hero 3 cameras (that have to be bought separately for around €200 each). 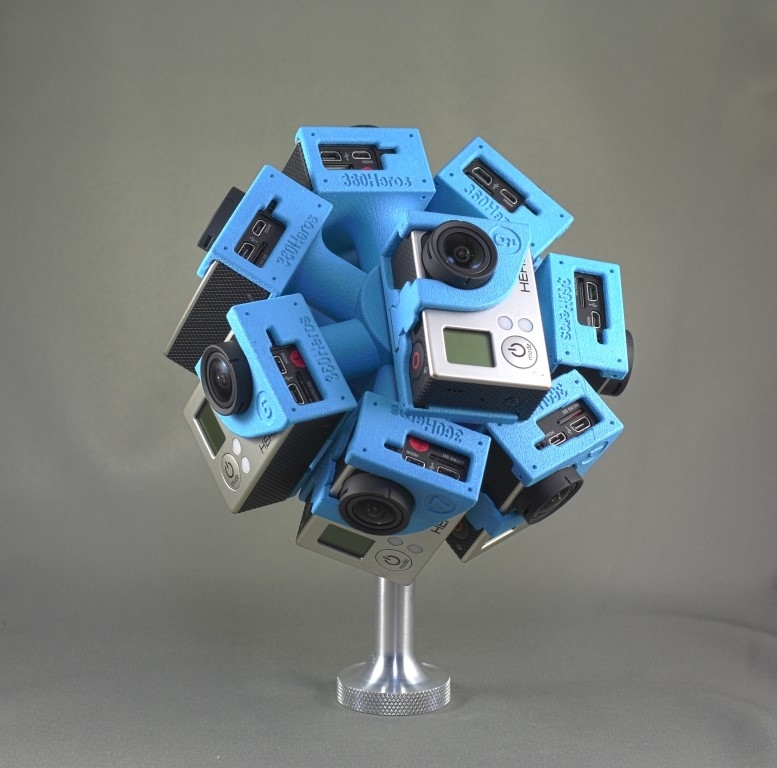 – Mount can hold 10 GoPro Hero 3 Black cameras. – Cameras are oriented vertically for full spherical images without nadirs on top and bottom. – Cameras provide the Hero3’s HD format with 2,716 x 1,524 pixels resolution. – Overall resolution of 12,000 x 6,000 pixels for equirectangular images, 5,200 × 2,600 @ 60/48/30 fps or 8,000 × 4,000 @ 30 fps for equirectangular videos. – A weight of 176 grams for the holder alone, 851 grams with all cameras equipped. Holders are even available for underwater usage. For an impression of the possible results, you can have a look at a video captured with the H3Pro10HD or into their video library. The technical background is nicely explained on the 360Heroes YouTube channel. Like the Heros spherical mount, the Freedom 360 GoPro Mount also mounts several GoPro cameras (in this case 6) on one device. 5 cameras are closely mounted in a circle with one camera being on top of this circle, creating a very compact and robust 360×180 degree mount. 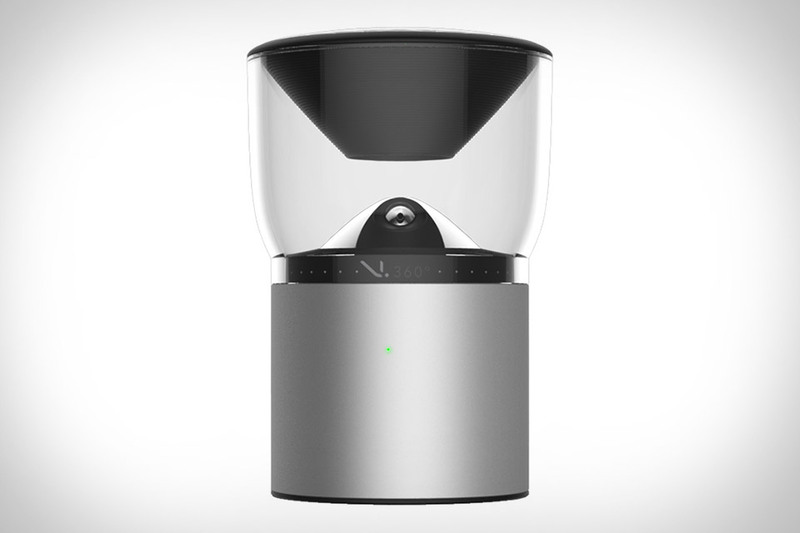 Each camera records its own video, which is appended to one 360° video afterward. Included in the price is a Wi-Fi remote which allows recording from another position. The device itself is made out of tough Nylon promising a rock-solid design weighing only 85gr. However, equipping it with all 6 cameras leads to a weight of 525gr. You can find more information about the Freedom camera mount here. 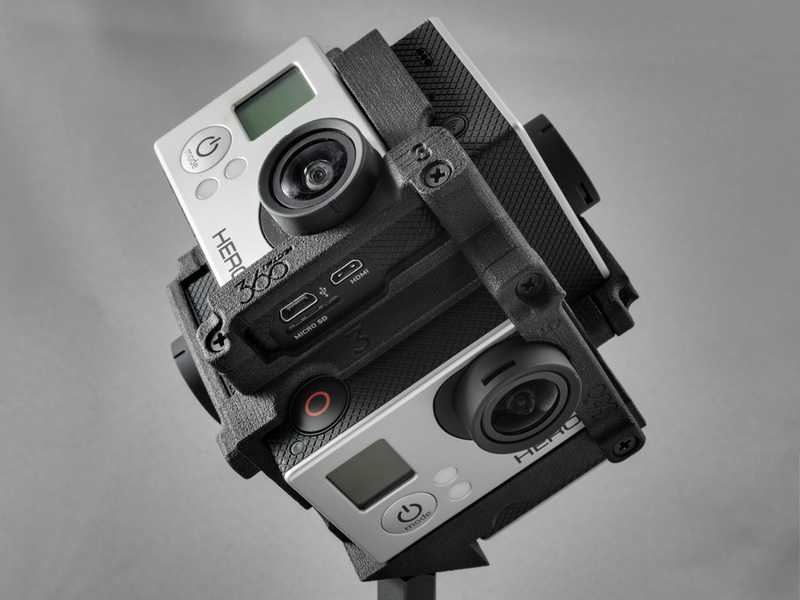 The Google Jump camera rig is another device for mounting and combining several GoPros. Google’s version consists of even 16 modules arranged in a circular array and is optimized for its own software Jump Assembler. Jump Assembler transforms the 16 individual recordings into one stereoscopic VR video, promising a perfect 360 video with a seamless panorama and the feeling of real world distances and depths in every direction. Moreover, Google claims that the assembled 3D videos have a super high resolution, which is the equivalent of five 4k TVs playing at once. More information about the Google Jump camera rig or its price has not been released yet. However, exemplary videos can be watched on YouTube. The iStart consists of four cameras with 10 megapixels each, providing an effective 50-megapixel output. It is sold as 360° imaging system for professional usage scenarios. It is available in three different versions that provide different features. The iSTAR Fusion can only capture still images, the iSTAR Pulsar can capture still images + videos and the iSTAR Pulsar Infrared can also record both, but in zero light with infrared vision. The system can be bought at several authorized resellers that have to be contacted for pricing details. – 4 sensors with 10 megapixels each: effective 50 megapixel output (resolution up to 10,000 x 5,000 pixels, +/- 7% due to stitching overlapping). – Full spherical 360º x 137º +/- 5º images. – WiFi and Gigabit Ethernet (RJ45) connectivity. – Capture time of approx. 4 to 6 seconds for full 360º photosphere. Many more details are available on their website. An example of a high-resolution result is available as well. The probably most common approach for professional users consists of a digital single-lens reflex camera (DSLR) equipped with a fisheye or wide-angle lens and mounted on a panoramic tripod head. The popularity results from several advantages. It is the most flexible solution because you can choose all parts for yourself and combine them individually, from the camera itself up to single rings and screws for different lenses. This allows you to achieve awesome image quality if you are willing to invest the corresponding time and money. Because the post processing has to be done manually you have to choose the right software as well. For example, you have to decide between a professional product for image stitching (e.g. Kolor Autopano Pro) or a freeware solution (e.g. Hugin), according to your skills and requirements. As you might see, the combination of equipment like this is kind of a science in itself. Thus, you’ll find many websites provide reviews for valuable equipment. Many tutorials give suggestions for a combination of different hardware and software elements, enabling you to create the best result for you and according to your needs. – A large variety of photosphere equipment (panoramic tripod heads, aerial poles, camera accessories etc.) is available at Nodal Ninja. A good first panoramic head could be the NN3 MKII Starter Package (F3500) for $189. – Motorized, fully automated mounts can be bought at Gigapan, starting with the GigaPan EPIC 100 (for DSLR) at a price of $549. 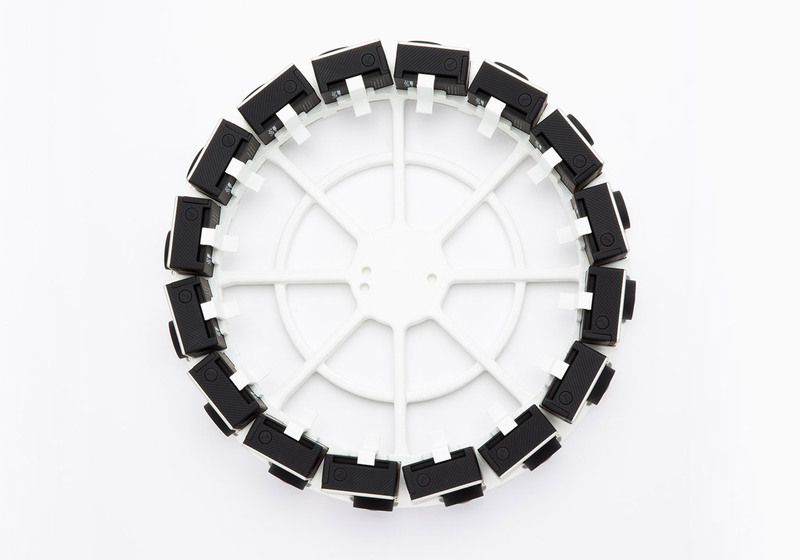 – The “world’s most advanced automated stitching head” Roundshot VR Drive 2 full is available for €3,360 at Kolor. – Rail track and cart systems (motion control systems that rotate and slide a camera) can, for example, be bought at Cinetics for $899. – Eye mirror offers innovative lenses (starting at $453) that support one-shot capturing of 360° videos or still images with different camera types. – The variety of DSLR cameras available on the market is unfortunately too large to give one representative example with pricing or a concrete recommendation but different websites with product tests and comparisons as well as guidelines for choosing the right camera for your personal use case might help you to make the right buying decision. The same applies to the corresponding fisheye or wide-angle lenses that have to match the camera. If you are interested in cinematic Virtual Reality filmmaking, you can have a look at a professional model like Nokia Ozo (55.000€) and Jaunt ONE (not for sale, only available for Jaunt studio partners). Thanks to Unimersiv.com and VRScout.com for their great guides on 360° cameras, which inspired this tutorial. Build your first VR tour with HoloBuilder with any of the above-described images. This entry was posted in Hardware and tagged 360 camera, 360 degree camera, 360 degree panorama, 360°, camera, full spherical images, hardware, holo, HoloBuilder, image quality, photo sphere, photospheres, quality, virtual reality, virtual tour, VR. Bookmark the permalink.